Tramontina has been making home cookware products since 1911. 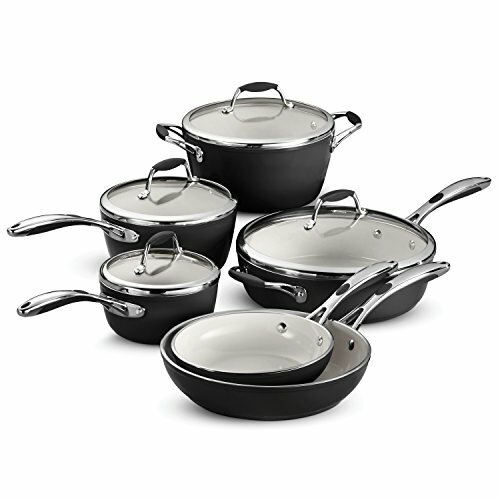 One of the brand's flagship products is the T﻿﻿ramontina 15 Piece Hard Anodized Cook﻿﻿ware Set. In this buying guide, you’ll discover nonstick, stainless steel, and professional cookware options in our Tramontina cookware reviews. The first thing that strikes us the about the pieces in this set is that everything seems to be built to last. It's made from heavy-gauge, anodized aluminum, and tempered glass that is both heat and shatter resistant. Anodization means that the aluminum underwent a special electrochemical process that made it more durable and sturdier than normal aluminum and other regular cookware in general. 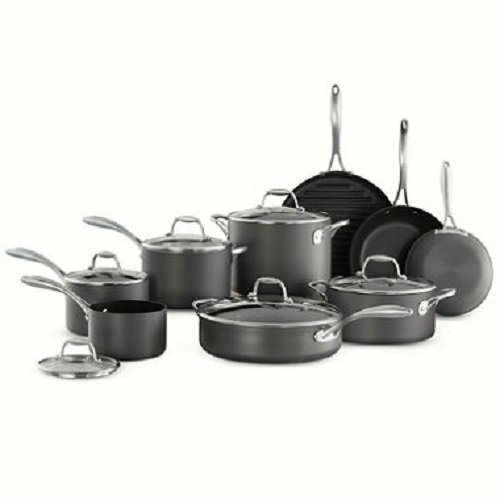 The same process also gives the pans their distinctive dark gray finish. This set can't be used for induction cooking, but it is compatible with electric and gas stoves. As with most nonstick coatings, you will need to take care not to abuse it (i.e. don't use high heat, don't clean it in the dishwasher, avoid using metal utensils, etcetera). This especially important because that type of abuse, or wear and tear, is not covered by the warranty. While we wouldn't consider this hard anodized cookware a budget set, we feel it's in the mid-range. The addition of a grill pan is unique and makes it a little more attractive. The Tramontina 12 Piece Stainless Steel set﻿﻿﻿﻿ contains pretty much everything you would need to prepare hearty meals in the kitchen. The tri-ply construction (wherein layers of metal are bonded together) allows for the even distribution of heat on the pan. If you have a substandard heating source, this will help cook your food evenly. This set can be used on all types of cooktops, including induction. It’s also dishwasher and oven safe. We love stainless steel because it typically lasts longer than nonstick, it can be a little tricky to prevent food from sticking. Whether you want to steam, stir-fry, sauté, simmer, boil, brown, or sear, the Tramontina Stainless Steel Set has the pots and pans you would need. Love casseroles, sauces, soups, and stews? If you're particularly fond of these kinds of dishes check out the Tramontina Enameled Cast Iron Dutch Oven. Of course, you can use the Tramontina Dutch Oven to make slow-cooked meals like chili and casseroles, but did you know that you can also use it to make soups. This product is specially crafted to allow the heat to disperse evenly and slowly. We'd also like to put a focus on the lid. There are ridges on the inside where liquids can condense and drip back in to the Dutch oven. This helps keep flavor in the dish rather than being evaporated. Clean-up however can be quite a problem. Sometimes soap and water is not enough to wash away the buildup of gunk in the bottom. The easiest way to clean it is to allow this product to soak overnight in soapy water. Is the Tramontina Dutch Oven worth it? 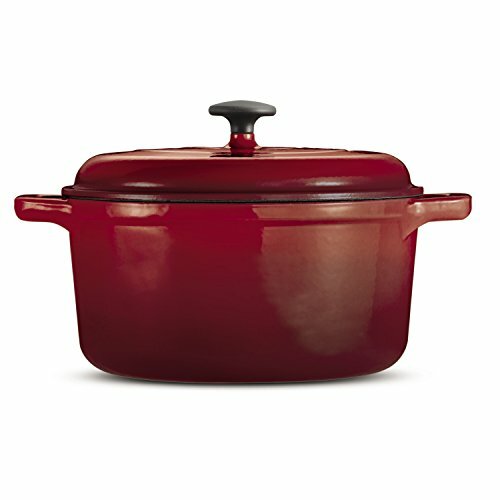 Compared to similar Dutch ovens like the Le Creuset Dutch Oven, this may be a no brainer if you're on a budget. Tramontina's professional frying pan is for serious chefs. Don't worry because it can also be used at home. 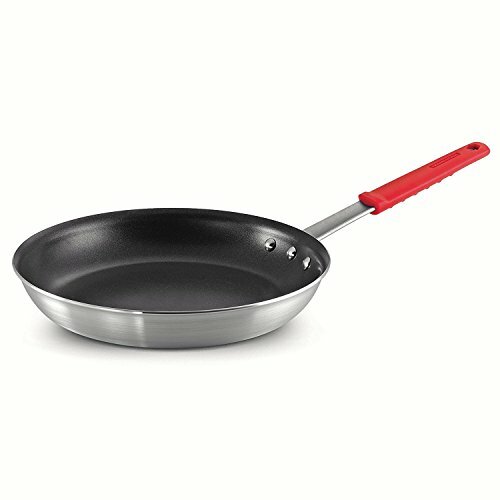 And compared to other high end frying pans, this one is actually quite affordable. Before we continue it's worth mentioning that Tramontina offers a wide selection of professional cookware and equipment. In this review we'll cover their nonstick frying pan which ranges from 8" to 14". It's important to note that the Tramontina frying pan was designed with professional kitchens in mind. The pan is made out of high quality, commercial-grade aluminum, specially constructed to allow for the even distribution of heat. The handle is attached to the pan with stainless steel rivets to help stabilize the two pieces and lessen heat transfer to the handle. The aim is to help prevent burns, but it still may get extremely hot depending on what you're doing with it. The silicone grip is detachable, so you can move the pan from stove top to oven. The nonstick coating is ECLIPSE® nonstick which is PFOA-free. While it's also dishwasher safe, we recommend hand washing all cookware to prevent the harsh environment that dishwashers can create. 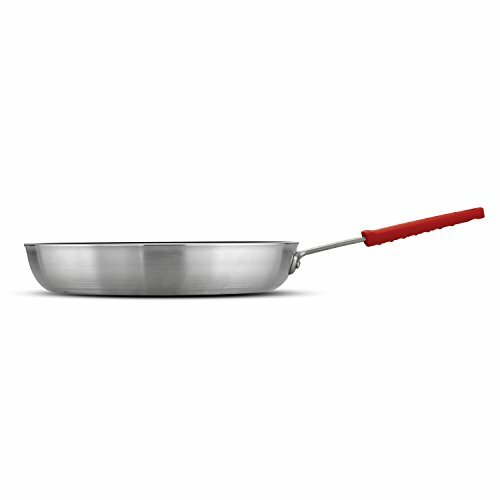 This frying pan is a little more heavy duty than your average pan, so for home use this might be an ideal pick! The Tramontina ceramic set is made with porcelain on the outside, ceramic on the inside, and aluminum in the middle. This means each pan is nonstick, pretty to look at and great at distributing heat. On the stove, they heat up quickly and evenly. However, this isn't a particularly oven safe set. Even if it didn't have silicone handles, ceramic pans tend to have a fairly low tolerance for high temperatures. This set is rated up to 350 degrees F, which means you'll need to be careful and keep the heat down below medium on most stoves. The handles on the pans are comfortable and stay quite cool while cooking, but the handles on the Dutch oven are a bit narrow and the edges can get hot as you cook. You may have to use potholders to protect your hands. It's especially important to line these pans with paper towels or cloth before storing them to prevent chipping the ceramic coating. On that same note, using silicone utensils is a must. While other brands offer a "scratch resistant" line, there's none of that here. You'll want to make extra sure that you read all of the literature Tramontina has provided and follow the instructions to the letter. The extra pampering you'll need to perform with this set might be too much for your household. If you've got kids or you hate waiting for your pans to cool before cleaning them, it might be wise consider another set. 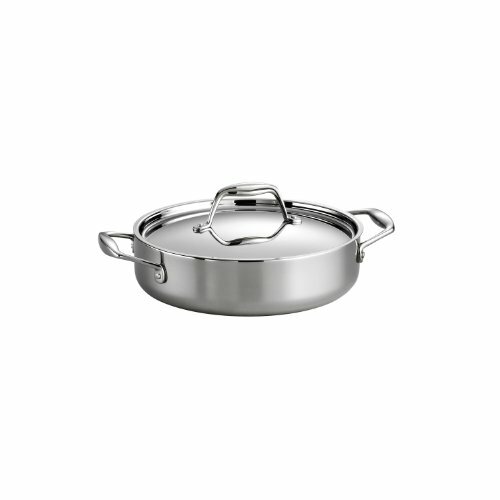 Finding stainless steel or nonstick cookware for your kitchen is not an easy task. There are thousands of brands to choose from that offer a variety of cookware and equipment options. If we had to choose the Tramontina brand to replace current nonstick cookware, we would choose the Tramontina nonstick set. To be honest, cooking with nonstick is just easier! Did you enjoy this guide? Let us know in the comments with your favorite pieces of Tramontina cookware and cooking experiences.